The calm, cool and collected nature of Cole Henry has been compared to the great Aaron Nola, which is about as good as it gets in terms of complements from Paul Mainieri. That’s why, if there was going to be a rubber match between LSU and Texas A&M, the coach wanted his blossoming star freshman on the hill. Henry, poised beyond his years and blessed with nasty stuff, rewarded that confidence with eight brilliant innings of two-run ball. He scattered six hits and struck out nine without issuing a walk. “I think we’re watching greatness develop before our very eyes,” Mainieri said. “Cole Henry is going to be a superstar, as I keep saying, in this league. He might already be a superstar. Zach Watson did the rest with four hits and three RBI as LSU cruised a series-clinching 9-3 victory at Alex Box Stadium on Saturday night. 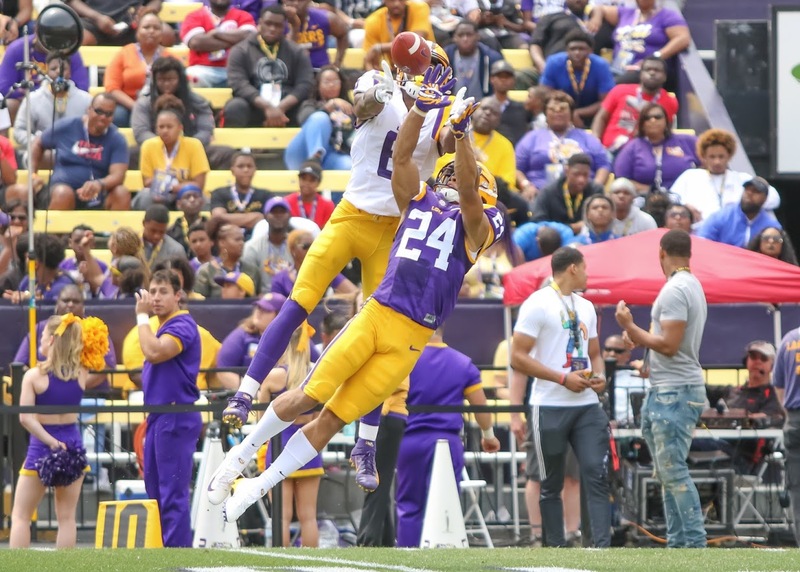 The victory moves LSU into a tie for first place in the SEC West. 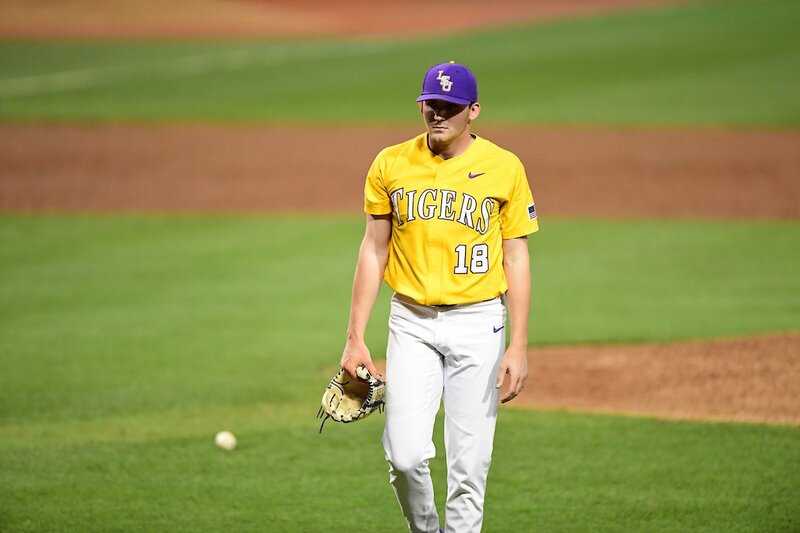 Watson’s heroics were redemptive after he struck out with the tying runs in scoring position in the ninth inning of LSU’s 6-4 loss earlier in the day. He finished 4-for-5 and a triple short of the cycle. LSU needed that kind of performance from Watson as Texas A&M continued to throw a parade of left-handed pitching at the Tigers in this series. Watson came through with a game-tying two-run double in the third inning and crushed a solo home run for insurance in the fifth. The collective excellence of Henry and Watson lifted LSU (23-10, 8-4 Southeastern Conference) past Texas A&M (25-8-1, 7-4-1 SEC) at the end of a long, sloppily-played day of baseball. Texas A&M struck first, just as it did in taking the day portion of the double header. Henry’s first pitch of the evening hit a batter, and the Aggies took advantage of more sloppy defense to take the lead on a two-run single from third baseman Mikey Hoehner. Henry induced a double play to get out of that inning without further damage and seemed to find a groove from there. There was steady traffic on the bases as the game went on, but Henry always seemed to be able to find that big pitch when he needed it. The freshman snapped off a nasty curveball to strike his way out of a first-and-third jam in the fourth inning. He induced another inning-ending double play in the fifth when Texas A&M was threatening to tie the game. LSU finally got him some support in the third inning after two singles and a walk loaded the bases. Watson smoked a ball that bounded off the glove of Texas A&M shortstop Braden Shewmake for a two-run double. An RBI single through the left side from Cade Beloso put LSU in front, 3-2, but the Tigers let Texas A&M hang around by getting two runners thrown out at home plate in the frame. No insurance came until Watson’s long solo home run in the fifth. LSU broke the game open in the seventh inning as Henry continued to cruise through the Aggie order. Antoine Duplantis snapped out of an 0-for-12 skid with an RBI single. Chris Reid followed with a sacrifice fly as Watson scored his third run of the night. Brandt Broussard followed with an RBI single back through the box. One inning later, Josh Smith demolished a two-run homer to left field, his fifth of the season and second of the weekend. That removed any semblance of drama from the result.